I don't normally sew very fast, but this pattern is pretty amazing. The booklet makes it easy - just follow the steps and suddenly you have most of a gown put together! 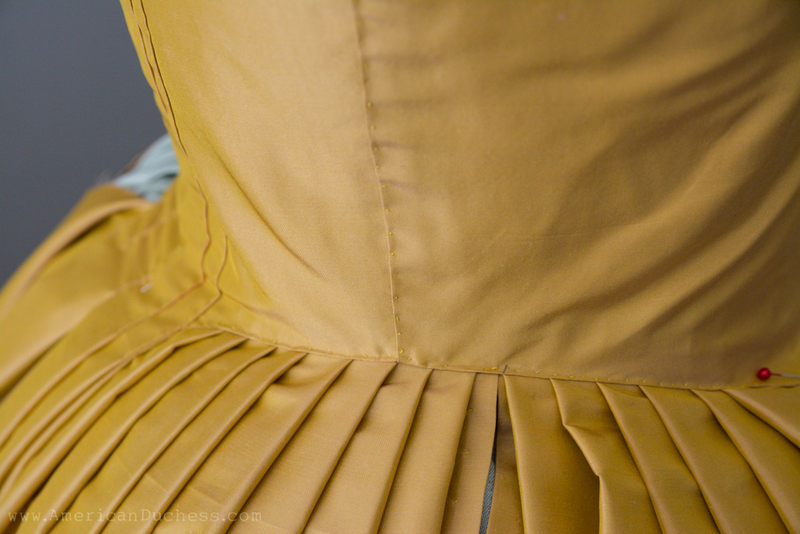 There are a couple confusing parts, but I was glad I had a little experience with the pleating on the back (from my Revolution Dress), so I could fiddle through it alright. No boning in the back yet, and no lining in the front, but it's looking pretty good so far. At this point there is no lining in the bodice front, no shoulder straps or sleeves obviously, and only one side of the skirt is pleated and attached. I still have a lot of work to do, but I'm really enjoying this project, so I hope it keeps going so well. Tiny prick stitches attaching the front bodice to the back, and the skirt to the bodice. I love this type of stitch. As to the sleeve trimmings, I've decided to go with the pinked flounces instead of the winged cuffs, so I can wear this gown in Williamsburg this Summer. :-) Yay! Excellent work - very neat stitching! And the colour is gorgeous. Well done you! Looks beautiful so far! I love the color of this silk, it looks like gold shot with yellow, so pretty! Very close, it's yellow shot with pale pink! I *love* the color!!! 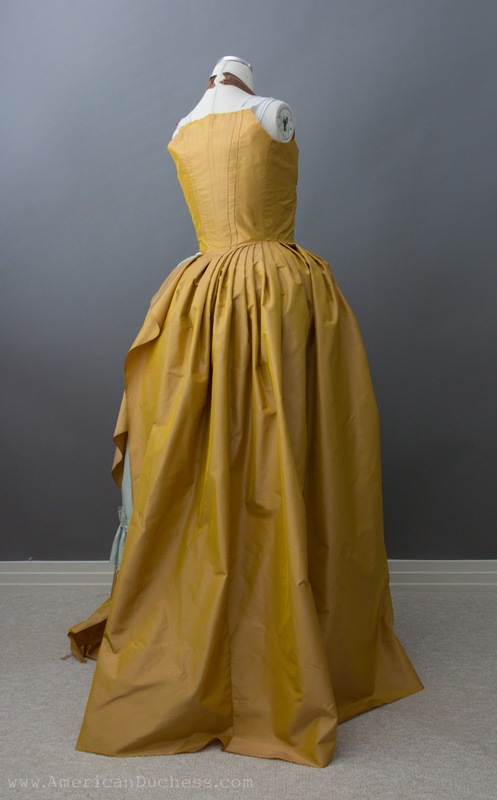 I love 18th century yellow gowns anyway, but this color is just awesome. Also, prick stitch for the win! I can't wait to see this when it's finished. Thank you! 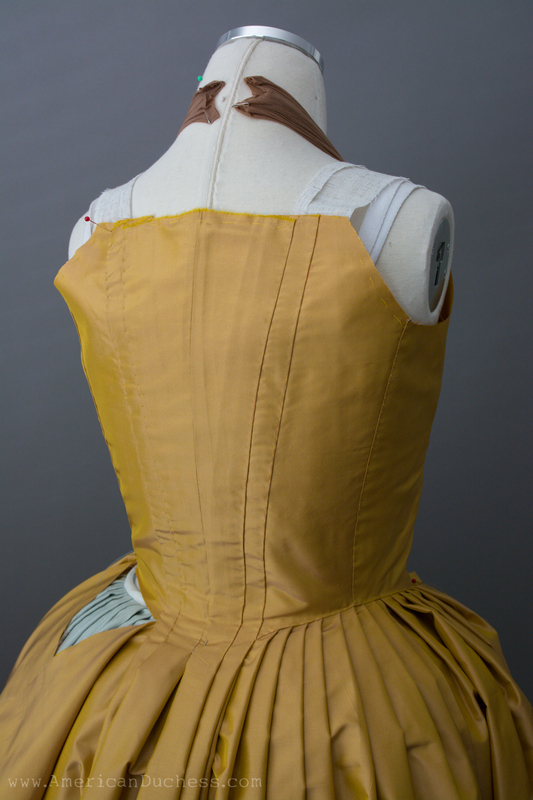 It's definitely a strong color, though not even as bright as some of the original 18th c. yellows. It'll take the full fluff - hair, hat, shoes, accessories - to pull it all off. It looks so good! Love the stitching! Lovely! I recently made a 1810s bonnet from almost the same colored silk. Cool! It was very popular in the Regency too. A friend of mine has a whole traveling dress made in this color, and it's just eyepoppingly gorgeous. Drool! This is gorgeous!!!!! Ooo the close ups of the stitching. Love. Sorry to revive an old thread....Would this pattern be an appropriate launching point for making a late 1980s redingote? I plan to make a ton of alternations, but am looking for a solid pattern to help me master the back pleating and sleeve setting. I'm just curious whether the bodice back cut is appropriate for a redingote. Thank you!